Traditional whoopie pies consist of two soft, slightly dry devils food mini cakes, generously filled with creamy white filling. The filling not only serves to keep this delectable treat moist, but adds a certain gooeyness to the eating experience that’s half the fun. While the origin of this delicious cream-filled confection can be indisputably traced to New England, the actual inventor of whoopie pies is not so clear, their history is cloaked in mystery supported only by legendary claims and conjecture. 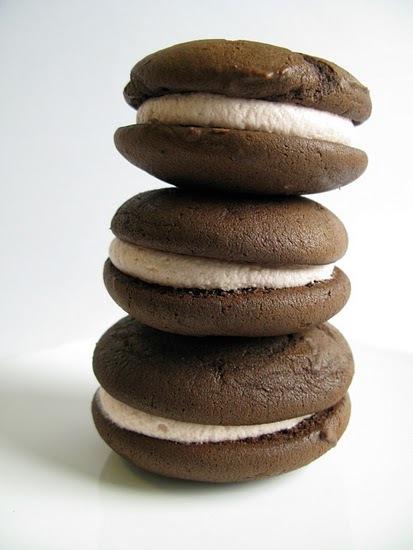 Today, the whoopie pie still maintains a solid presence in Pennsylvania through many venues including the annual Whoopie Pie Festival, which began in the town of Hershey in 2005. Whoopie Pies can also be purchased at restaurants, bakeries and roadside stands throughout the state. Although many historians seem to favor Pennsylvania as the birthplace of the whoopie pie, the Labadie’s Bakery in Lewiston, Maine claims to have been producing these individual cake sandwiches in traditional chocolate and vanilla flavors since 1925. There are a number of other stories attempting to establish credit for inventing the whoopie pie. One such story is that Durkee-Mower, the company who manufactures Marshmallow Fluff, an ingredient in the filling used in some whoopie pies, invented the sandwich in the attempt to increase sales. However, the cookbook containing this filling recipe was not published until 1930, making this claim invalid. Another story centers on the Berwick Cake Company of Boston, Massachusetts. Unfortunately, the bakery went out of business in 1977, so they are unable to substantiate any such claim. And so the debate continues and the question of exactly who and when the whoopie pie was invented remains a mystery. One thing of which you can be certain, the following recipe for Classic Chocolate Whoopie Pies will bring you accolades from both young and old alike. So bake on, and add a little whoopie to your life. This entry was posted in Cookies, Desserts and tagged chocolate, food, foods, sweet shops, travel by grubamericana. Bookmark the permalink.